MANILA, Philippines – In the interest of fairness for out-of-school youth and adult (OSYA) learners whose hopes and dreams for better opportunities are anchored on the Alternative Learning System (ALS) program, Department of Education (DepEd) Secretary Leonor Magtolis Briones adjusted the passing score of the 2016 Accreditation and Equivalency (A&E) Test conducted last November 2017 from 75% to the generally accepted passing score of 60%. The decision was made by the Education chief, in consultation with concerned officers and personnel of the Department, following a thorough evaluation of factors that contributed to the dismal result of the test, such as change in language of assessment, difference in design between the previous and the present tests, and length of time between intervention and conduct of test. 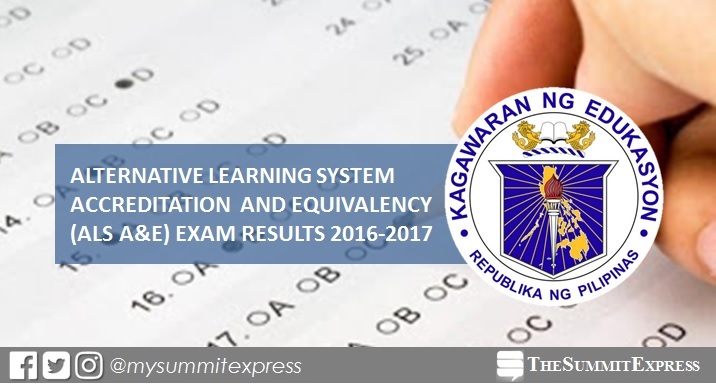 With the change in passing score, the passing rate jumped to 46.8% from 16.49% of the 15,845 elementary level examinees and to 62.08% from 15.58% of the 168,167 junior high school level examinees. The Division Testing Committee (DTC) of School Division Offices are, therefore, instructed to accommodate the November 2017 A&E takers who still did not reach the adjusted passing score as walk-in examinees on March 4 (Luzon) and 11 (Visayas and Mindanao) despite non-presentation of required documents (e.g. Certificate of Rating or COR). The same adjusted cut-off score shall be implemented, but only to the aforementioned tests. DTCs shall prepare and facilitate the registration of these walk-in examinees at the testing center from 6:30 a.m. to 7:45 a.m. prior to the pre-test activities. Only the examinees who took the A&E Test last November 2017 but did not make it to the adjusted passing score and the learners who earlier registered for the March 2018 test are qualified to take the exam. Photocopying of answer sheets is allowed only for the March A&E Test administration to ensure that all qualified examinees will be able to take the test. Moving forward, the Secretary has instructed concerned officers and personnel to conduct a comprehensive review of the A&E examination standards, including its alignment to the existing learning resources and instruction delivery. She also ordered the suspension of the provision in DepEd Order No. 55, series 2016 that sets 75% as the passing score until further notice. ALS, as the administration’s flagship program, has the full commitment of the Secretary. True to the learners’ byword, “Sa ALS may pag-asa,” the Department continues to expand and intensify ALS projects and partnerships so that more OSYAs may be provided with options, either through skills training or higher education, to improve their lives and to contribute to nation-building. Questions and concerns about the A&E Test may be addressed to the Bureau of Education Assessment (BEA) at (02) 631-2591 or (02) 631-2589, or at nelia.benito@deped.gov.ph.